We’d love your help. Let us know what’s wrong with this preview of The Code for Killing by William Savage. Dr. Adam Bascom, called to help a man who’s been brutally assaulted, is drawn into solving a series of murders in a world of deceit, violence and treachery. Murder and mystery return to the life of 18th-century gentleman physician, Dr. Adam Bascom. Bored with the tedium of his country practice, Adam finds himself called urgently to Norwich to treat a young man assaulted and left with total memory loss. Other mysteries follow thick and fast. What caused the man to walk alone, at night, along the deserted river bank? Who murdered a King's Messenger and dumped his body in the river? How did a file of secret government papers go missing and how could a local miller have been killed twice in quick succession? Helped by his friend, Peter Lassimer, his mother’s companion, Miss Sophia LaSalle, and a cast of characters old and new, Adam must disentangle the mass of lies, intrigue and deception that form “the code for killing”. To ask other readers questions about The Code for Killing, please sign up. The second book featuring Dr Adam Bascom is somewhat more spirited than the first in tone, events and dialogue with a varied and interesting set of characters. Adam makes several trips between his home in Aylsham to Norwich where his mother lives and where he is also caring for a young man who decoded messages in the spy business before he was attacked. There are pressures on trying to be available to patients, but his contact from Whitehall, a Mr. Wicken, trusts him to resolve murders that may The second book featuring Dr Adam Bascom is somewhat more spirited than the first in tone, events and dialogue with a varied and interesting set of characters. Adam makes several trips between his home in Aylsham to Norwich where his mother lives and where he is also caring for a young man who decoded messages in the spy business before he was attacked. There are pressures on trying to be available to patients, but his contact from Whitehall, a Mr. Wicken, trusts him to resolve murders that may or may not be connected. Adam is able to succeed where Wicken cannot. He has some amusing experiences in these travels including the meeting of one admired actress who invites him to the theatre. I really enjoyed this and feel lucky that I did not find these books earlier since I can roll right into the next. We are proud to announce that THE CODE FOR KILLING by William Savage is a B.R.A.G.Medallion Honoree. This tells a reader that this book is well worth their time and money! 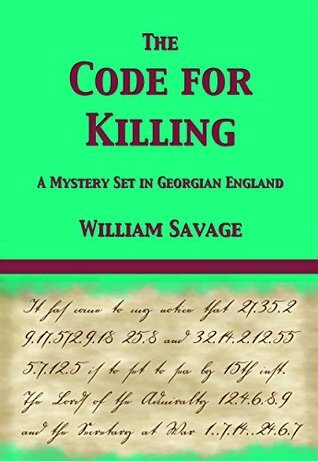 The Code for Killing is a fascinating historical mystery set in Georgian England. It is the second novel in a series and there are fairly frequent references to the previous mystery, but the novel can be read and enjoyed without any previous knowledge of the first book. The main character is Dr Adam Bascom - a man who, for all his intellect and skills, has very little understanding of women, much to his mother's despair and also amusement. Adam relies on quite a few women to help him solve the mystery, including the delightful and spirited Miss Sophia LaSalle. I do hope there will be a sequel as I would love to hear more from this character in particular. The mystery is set in the turbulent times of the late 1700s and there are many details about the political situations of the period, such as the riots in Norfolk, that add greatly to the vividness of the storytelling. The characters come from all walks of life - we meet the wise Sir Daniel Fouchard, Miss Phoebe Farnsworth the actress and the wonderfully named pair of sailors, Peg and Dobbin, to mention a few among many gems. The details of medical conditions and treatments at that time are described in interesting detail and I was very amused when London was described as 'noisy and crowded' by Adam on his welcome return to Aylsham - some things don't change! Excellent series! I'm looking forward to book four, which I believe is soon to be published. This is an interesting story with some twists and turns. The characters were also entertaining. This review is for Rosie’s #Bookreview team. The Code for Killing is the second in a mystery series set in Georgian England. I read the first in the series and was intrigued by the historical setting and, since I’m married to a physician and taught medical students for years, was drawn to the sleuth, an MD and his closest friend, Peter Lassimer, a pharmacist and a confirmed ladies’ man. I liked this book even better than the first. The main character, Dr. Adam Bascom, is written with more depth This review is for Rosie’s #Bookreview team. I liked this book even better than the first. The main character, Dr. Adam Bascom, is written with more depth and angles to his character. He is highly intelligent with keen deductive skills, but as the story opens, he is bored with his rural practice and despairing of many of his patients – cantankerous wealthy people who do not pay their bills. He enjoyed his role as a novice detective in the first of his investigations, when he sussed out the murderer of man whose body was found in a graveyard, and longs for more excitement. He is also clueless about women, and his mother despairs he will ever form any attachment leading to marriage. Bascom doesn’t have to endure his situation for long because he receives an urgent summons from Mr. Wicken, who had some interaction with Bascom on the previous case and heads up a clandestine department of the British government charged with finding spies. A young man has been attacked in Norwich. He is in a catatonic state, and Bascom is asked to treat him because this man is an important a code breaker for the government. In addition, the King’s Messenger who was bringing the young man documents to decode has been murdered, and the documents are missing. Before he can get to Norwich, however, Bascom is summoned by his brother to do a post-mortem on an unpopular miller and testify at the ensuing inquest. The way in which the author unravels all the threads of the story is compelling. Characters are one of Savage’s fortes. He introduces us to several women who attract Bascom’s attention: the delightful and intelligent Sophie LaSalle, his mother’s companion, who insists on helping him with his investigations; the flirtatious Phoebe Farnsworth, an actress who introduces Bascom to the London stage; and the young and faithful wife of the elderly and wise Sir Daniel Fouchard, who requests the skills and company of Bascom to manage his pain while he is dying. Even more colorful are Captain Mimms, an old friends of Bascom’s, whose help he enlists in the investigation; two of Mimms’ former crew, the amusing scoundrels Peg and Dobbin; and Molly, a young prostitute with a heart of gold. Beyond the characters, what I particularly enjoy about these books is the history of the politics of time (food riots, possible war with France, privateers and spying) and descriptions of the practice of medicine and pharmacy. Savage also gives the reader a fine-tuned description of Georgian society and manners and lively dialog in the manner of the times. The conversations drive the story. I was decidedly kept guessing about where the various threads of the story would lead and how they would come together as they twisted and turned around Bascom’s detecting. This is story telling at its best. I give The Code for Killing five stars and highly recommend this series. Is it obvious I’m looking forward to reading the next book? I loved William Savage's debut novel, An Unlamented Death, so was eager to read the next in the series. The Code for Killing re-acquaints us with 18th century Norfolk doctor Adam Bascom, who has, once more, become involved in a murder mystery, this time to do with a possible spy passing information to the French. I enjoyed this book even more than the first; it was one of those I was disappointed to finish. When reading this book I became completely absorbed in the time and the characters; however, I did find myself wishing for more descriptive detail. I am familiar with some of the landmarks, such as the Maid's Head Hotel, Gentleman's Walk and Cow Tower in Norwich, and also the Black Boys in Aylsham, so I could imagine the settings, but for anyone who doesn't know Norfolk it might not be so easy to do so. For instance, on Adam's journeys to London I was looking forward to reading about what the landscape was actually like between Norwich and London. What was the inside of a Drury Lane theatre like? A London Inn? The inside of the seedy Lampson's cafe? How about the road from Norwich out to the coast? Historical fiction addicts like me love to read about times gone by because we want to immerse ourselves in the past—so we want to know what these people of over 200 years ago would have seen! The same with the insides of the houses, the day to day activities. There was more description as the book went on, but I yearned for yet more! I am not a one for pages and pages of description of soft furnishings and clothes, but a little more creation of atmosphere would have made me enjoy this book even more. In An Unlamented Death, William Savage’s previous novel The Code for Killing opens on a damp miserable day in 18th century Norfolk, where young Dr Adam Bascom is in a foul mood. Fed up with traipsing through the muddy tracks to visit cantankerous wealthy patients, who are reluctant to pay his bills, he is in need of a change and perhaps some excitement. But soon his life is taken over by murder investigations and constant travel from his small north Norfolk village to Norwich and also to London. Better than the first in this series, though I still can't quite fathom why the big chief from Whitehall has such a high opinion of our hero: he's a pleasant chap but not much out of the ordinary in the intelligence line to me. The author seems more relaxed with the period now and this made for a more enjoyable read. I hope there will be more. I started to write fiction as a way of keeping my mind active in retirement. I have read and enjoyed hundreds of detective stories and mystery novels. One of my other loves is history, so it seemed natural to put the two together. Thus began two series of murder mystery books set in Norfolk. All my books are set between 1760 and around 1800, a period of turmoil in Britain, with constant wars, rev I started to write fiction as a way of keeping my mind active in retirement. I have read and enjoyed hundreds of detective stories and mystery novels. One of my other loves is history, so it seemed natural to put the two together. Thus began two series of murder mystery books set in Norfolk. The series featuring Dr Adam Bascom, a young gentleman physician caught up in the beginning of the Napoleonic wars, takes place in a variety of locations nearer the North Norfolk coast. Adam builds a successful medical practice, but his insatiable curiosity and knack for unravelling intrigue constantly involve him in mysteries large and small.